Mobile operator Three has been taken to task by rival EE over implying that its '3.9G' network coverage gives mobile users close to 4G speeds, leading to the Advertising Standards Authority banning the ads. EE took issue with the digital, press and poster campaign, which was created by agency Wieden + Kennedy, arguing that the ads were misleading. Both a press and a poster execution were headed, "4G is nice. But our Ultrafast network is built for more". It added, "Running at what we affectionately call 3.9G, our Ultrafast network is built to give you all-you-can-eat-data. So you won’t run out when sharing pictures of happy cheese graters. And when we roll out 4G, we’ll nudge you up without charging for the privilege. Which is nice too." Meanwhile, Three’s website offered consumers "faster internetting without paying a premium", and said "you shouldn’t have to wait for 4G to get a great internet experience". A page on the blog section of the site added, "What you might not know, however, is how close Ultrafast speeds can be to 4G speeds. So close in fact, that we're affectionately calling our Ultrafast network 3.9G"
EE complained that the "3.9G" label in each of the ads was misleading as it implied that the speed of Three’s broadband service was very close to that of 4G services and that the statement "our Ultrafast network is built for more" could not be substantiated. Three-owner Hutchison defended the ads, arguing the term "3.9G" was not being used as an official technological term, but to convey how its DC-HSDPA network was "one step below" 4G technology, stressing that in the US, HSDPA is known as 4G. Three said the term was meant to communicate the superiority of its network speed over that of 3G. 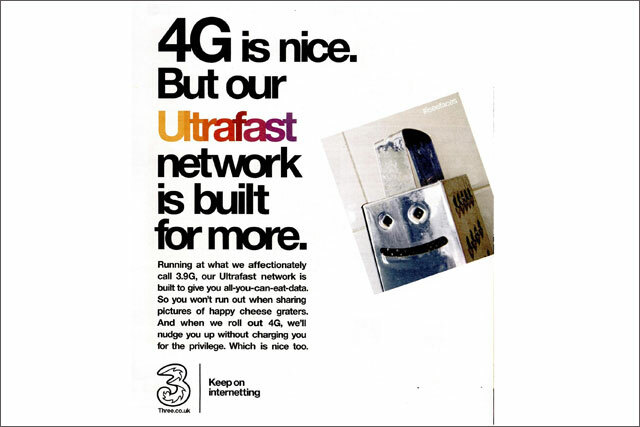 While the ASA accepted that the ads did not imply that "3.9G" was an official term, it considered that the term did imply that speeds were close to 4G. Three had provided documentary evidence to the ASA to substantiate its claims, denoting the differences between DC-HSDPA and 4G . However, the documentation was deemed too theoretical and lacking in evidence of measurable comparable speeds. Therefore the ads were ruled as misleading. The ASA also ruled that Three had failed to substantiate the "Ultrafast" claim, which was also ruled as misleading.